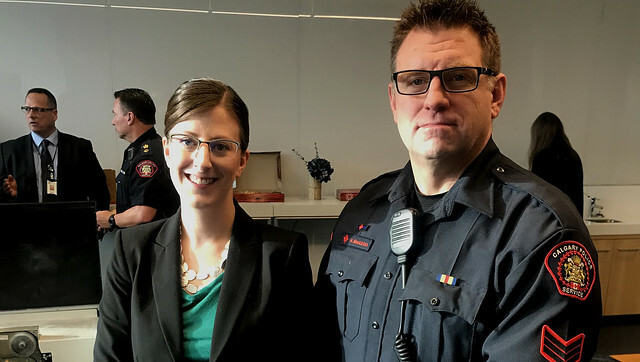 Service Alberta Minister Stephanie McLean has kicked off the 14th annual Fraud Prevention Month to help Albertans recognize, report and stop fraud. Minister McLean and Calgary Police Service Sgt. Andrew MacLeod pose during the kickoff of Fraud Prevention Month at Mount Royal University in Calgary. Throughout this month, the government is partnering with local police forces, RCMP, Revenue Canada, Better Business Bureaus, crime-prevention groups and business organizations to raise awareness about different types of scams and share tips using the #FPM2018 hashtag. In Alberta, home renovation fraud remains one of the most common complaints received by Service Alberta. Recently, there has been an increase in unlicensed, pre-paid contractors using online advertising to deceive Albertans about qualified and licensed services that don’t necessarily exist. With spring renovation season around the corner, this is the latest tactic used by unlicensed contractors who take deposits and don’t complete the work. In Alberta, contractors who take money up front in your home or away from their place of business must be licensed and post security. Currently, the majority of all active investigations by Alberta’s Consumer Investigations Unit are related to contractors operating without a licence or outside of the regulations. The provincial government is working to make life better for Albertans with new consumer protection laws, a ban on door-to-door sales and a 37-member Consumer Investigations Unit that takes action to protect Albertans from scams, bad deals and fraud. In the last fiscal year, their investigations led to the courts ordering over $1 million in fines and restitution back to consumers. “In 2017, Calgarians lost over $61 million in fraud-related crimes. It's important that all citizens know how to recognize and protect themselves from a scam, whether it's done over the phone, in person or online. We're pleased to work with our fraud-prevention partners to help citizens become more fraud-aware." If a contractor wants payment up front, check if they are a licensed and bonded business at servicealberta.ca or by calling the Consumer Protection Line, toll-free at 1-877-427-4088. Do not blindly respond to online advertisements for contractors without first verifying qualifications and licensing. Get at least three estimates before entering into a contract. Always get estimates and contracts in writing; make sure they include key dates, cancellation rights and a description of materials to be used. You may cancel a contract up to 10 days after you receive a copy, if the written contract is solicited, agreed upon or signed at your home or at another location away from the contractor’s normal place of business.